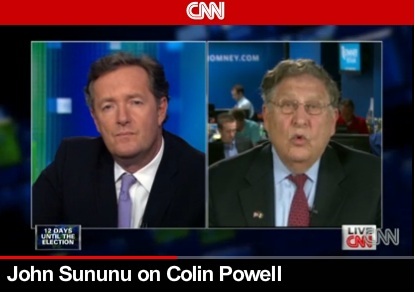 John Sununu, co-chair for Mitt Romney campaign, charges Colin Powell with endorsing President Obama because he’s of the “same race” on Piers Morgan Tonight, Thursday, October, 25, 2012. *The elections are getting close and all kind of wack jobs are making last ditch efforts to save Romney’s campaign against the president. But to no avail, the lack of understanding and/or disconnected rich dummy antics are not doing the trick. It just goes to show that all the money in the world can’t buy you a clue when it comes to common sense. And the campaign that President Obama is running as well as his policies already in place, are just common sense. But people like John Sununu, Mitt Romney’s top attack dog and former White House Chief of Staff who is a co-chair of Mitt Romney’s campaign, would not be able to see that because of his obvious generational disadvantage. In other words, his racist views. When news spread of Colin Powell’s endorsement of President Obama, Sununu appeared on Piers Morgan Tonight saying that Colin Powell, who is a Republican, was siding with Obama because he’s black. Since the semi-white Sununu (Lebanese) is only supporting and acting as an attack dog for Mutt because of skin color and shared racist ideology…he thinks everyone is motivated by the same things. Colin Powell can endorse whomever he chooses, he knows the Repubs lame azz agenda are a bunch of BS and if he is going with Pres Obama because he is black then still So What!!! that is still his choice. This is soooo interesting how someone of an oppressed people can join forces with his oppressor. Sununu is of Lebanese-Arab lineage and just recently on his trip outside of the U. S. Romney called the Palestinians uncivilized. It’s a d@mn shamed when a NATURALIZED american like Sununu and Maharaja Piyush Bobby Jindal can come to these shores and criticize the people who built this country. Sununu is ALLEGED to be a “Mensa Genius” but some of the most brilliant people in the world are just plain stooopid!! !